It was one of those bone-crunchingly cold days in February 2013, and I was shaking off the effects of flu in a somewhat unconventional manner by standing in sub-zero temperatures outside Colchester station in north Essex waiting for my friend John to pick me up. It wasn't John's fault; I'd caught an earlier train from Ipswich than I'd planned, without really thinking about having to wait at this end. Fortunately, John is always on time in an old-fashioned, well-mannered kind of way - as, indeed, are all the people I make regular excursions with. How on earth do they put up with me? We headed out of Colchester towards the hills of south Suffolk, crossing the county border at Nayland and soon entering the parish of Leavenheath. I remembered vividly coming this way before, more than ten years ago. It was the wettest day of the Autumn of 2002, which is saying something. We were on our way to Sudbury after spending the morning in Colchester. There had been times during the morning when I simply could not see my hand in front of my face, let alone any buildings, but near Nayland the rain stopped, and a few minutes later a cunning plan had occured to me. In this corner of Suffolk, there was only one Anglican church that I had not photographed, and I mentioned this casually to my chauffeuse. She took it as a challenge - "Let's find it then!" - and so we started to look for Leavenheath church. I knew the parish well - or thought I did. The main Colchester to Sudbury road runs through it, and I must have done this same journey a hundred times. It was only when I started looking for St Matthew that I realised I hadn't ever really noticed Leavenheath before. There is no village centre, no main High Street leading off into shops and housing estates. There are modern houses, but they are on the road to Bures; otherwise, the whole place is nothing more than a scattering of gathered cottages and farmsteads. And there is a good reason for this; Leavenheath is not really a village, or even a parish, at all. The Leven Heath, as it was, is a vast area of open land that spreads itself between Nayland, Polstead, Boxford and Bures. Apart from the A134, it is only dissected by narrow lanes, some of which get blocked by the sandy soil washed out of the fields in heavy weather. I assume that it was all used for grazing sheep until the late 18th century, when it remained one of the few unenclosed places in Suffolk. Not for much longer: enclosure brought settlement, and settlement brought the established church out of Stoke by Nayland, in which parish most of this place actually is. At the cost of £400 9s 5d, (about £80,000 in today's money, a bargain then or now) the new church was constructed in red brick, and consecrated on the morning of the 13th September, 1836. It was a little towerless chapel, much in the contemporary style, with few of the trimmings that the growing sacramentalism of the next few decades would demand. Broadly speaking, it is the part of the present church to the north of the tower, although I think that the lovely white frontage, porch and buttressing must be later, for reasons that I will explain in a moment. The architect was G R French, and an intriguing passage in White's 1844 Directory of Suffolk notes that it was built near the site of an old Quaker burial ground. Since such things were usually beside meeting houses, perhaps there was already a Friends' presence on the Heath before the Anglicans came along. The new church had the status of a chapel of ease to the mother church at Stoke by Nayland, but was provided with its own minister, the fiery evangelical Harold Curry, who, White tells us, had his own adjoining house - this must be the one to the rear of the site, now a private house. The minister was also provided with two acres of land, and a 3% return on £1,100 in stock. 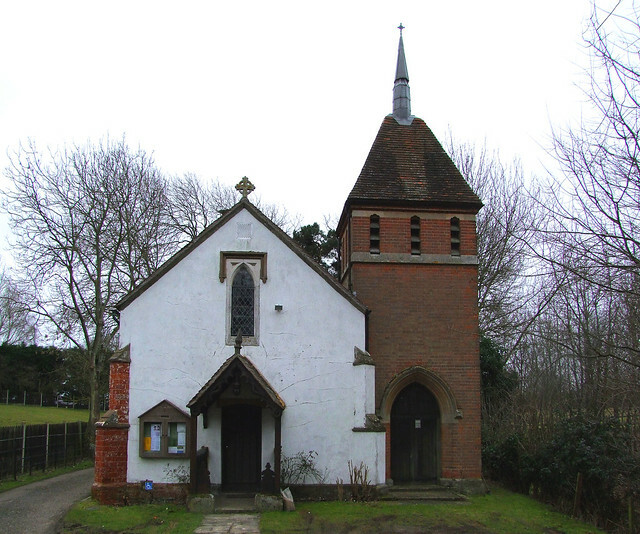 By the time of the 1851 census of religious worship, the little chapel was maintaining morning and evening services, with an average attendance of 120 for the first and more than 200 for the second. It must have been a tight fit. So much so that, in 1880, Mortlock tells us that the architects Satchell and Edwards were called in to extend the building. They built the splendid bell tower with a wide south aisle behind it, and extended the original church eastwards with the addition of a chancel. These are strongly in the Tudor style, even with the addition of wide Perpendicular windows, and so I think they must also have been responsible for the frontage now in place on the original church, with its porch, all of which is fully Tudor in style. For example, the lancet window above the entrance matches a double one in the south wall of the new chancel. The use of unnecessary buttressing would have been fully in keeping with the style of the 1880s. So, we may assume that the architects completely transformed this place. So, where was it? We headed west from Nayland, looking at both sides of the road for a clue as to where the church might be. I fully expected to have to drive off into the middle of nowhere, but just when we had almost reached Assington, I saw it, right beside the road in a dip, surrounded and hidden by great chestnut trees. I must have driven past it so many times, but I had never noticed it before. The little garden in front of the church is a paradise for conker-hunters. I had never seen such a density of the beautiful brown seeds in one place - they carpeted the wet ground like jewels. I reached down and pocketed one, an ornament, a keepsake. St Matthew was not open that day, but for the last few years it has been open every day, the west door propped open in a friendly, welcoming way. I was pleased about this, because such relatively insignificant and unimportant churches are all too frequently left locked from one Sunday to the next. But there is something of great interest at Leavenheath that I had long wanted to see, and that is the collection of WWI cemetery crosses, one of the largest collections in East Anglia. John and I stepped inside, and were pleased to be met by the very churchwarden who had contacted me to let me know the church was now kept open, several years before. The cold day was gloomy, at it took a moment to adjust our eyes to the interior, but when we did it was to see a pleasant, red brick space, the eye drawn eastwards to an apse, and the war memorial the main feature on the north wall. When the dead of the First World War were gathered together to be buried in military cemeteries in northern France, the temporary wooden crosses that had marked their graves were replaced by more permanent stone markers. The families could apply to have the original grave markers sent home, and often these were displayed in the village church, perhaps with a photograph of the dead. They are terrible things to see - almost all of them were young men in their late teens and early twenties, and all of them must have been well-known to everyone else in the village. Over the years, many of the crosses have disappeared, perhaps taken back by families, or more likely discarded as an irrelevance. But St Matthew still contains seven of them; only Old Melton, near Woodbridge, has more. And Leavenheath retains some of the photographs of the young men too. In these dark days, they are a reminder of the horror of war, and should be a constant reminder to us that no good will come of it. The crosses flank the parish war memorial, creating a kind of shrine effect. They have all been repainted and relettered, which in a way is a shame, but it does give them a strange sense of community, a reminder that in such a tiny place they would all have known each other, and many of them will have gone off to war together. There are three Lockes, two Prykes, a Hollick and a Palmer. Oddly, the three Lockes all have their surname spelled the same way on the crosses, but on the memorial only one of them has the final E. Charles John Locke was a serjeant in the Suffolk Regiment - as, indeed, were two of my great-grandfathers. He was killed on the 10th September 1916, and is buried in Abbeville military cemetery on the Somme. He was the son of John and Eliza Locke of Leavenheath. Arthur William 'Billy' Lock was a private in the Suffolk Regiment, and was killed on 18th November 1916. He was 24 years old. Billy was the son of Thomas and Mary Ann Lock of Leavenheath, and is buried at Choques Military Cemetery in the Pas de Calais. Robert Lock was also a private in the Suffolk Regiment, the brother of Mrs Hasler of Castle Hedingham. He was killed on January 18th 1918, and is buried at Artillery Wood Cemetery near Ypres. GHJ Hollick's cross includes the initials MM, for Military Medal. he was the son of Mrs Louise Hollick of Leavenheath, and was killed just a month before the end of the War. He is buried at Guizancourt Military Cemetery at Gouy on the outskirts of Rouen, a long way behind the front line and suggesting that he died in hospital. Edgar Pryke was a Lieutenant in the Royal Flying Corps, who was killed over France on 30th November 1917 (the war memorial gives the year wrong). He was 22 years old, and a resident of London, although originally from Stowmarket. It isn't clear what his connection with Leavenheath was. Percy Pryke was a private in the Hampshire regiment, and was killed during the attack on Gallipoli on 13th August 1915, according to the CWGC database, although the war memorial gives the date as the 14th. He is remembered on the Helles memorial above the Bosphorus. Frederick George Palmer died a few weeks after the War ended, in Cairo, Egypt, on the 17th December 1918 (18th on the war memorial). A Private in the Suffolk yeomanry, he is buried in Cairo Memorial Cemetery. He was the son of George Palmer of Spring Farm, Leavenheath. The crosses are a haunting survival, a memory of the lost boys of Leavenheath, but in another way this church is a survival in itself, and they would recognise it instantly if they were to step into it today. Everything is neatly kept and looked after, but there is still a sense of its Edwardian heyday before the boys went off to War. There is a memorial in the elegant red brick chancel to the Vicar who oversaw the expansion of the church in the 1880s, and a pleasing little modern brass to Kate Locke, for some years a member of this choir. She died in July 1915, presumably a relative to one or more of the Lockes commemorated by the crosses, but her death was before the terrible news of any of them could be sent home from France. An earlier survival is the simple font, typical of the pre-ecclesiological fashion of the early 19th Century. It was presumably installed here when the church was very first opened. I liked St Matthew's church very much. It is simple, seemly, and has a real sense of its place in its local community.